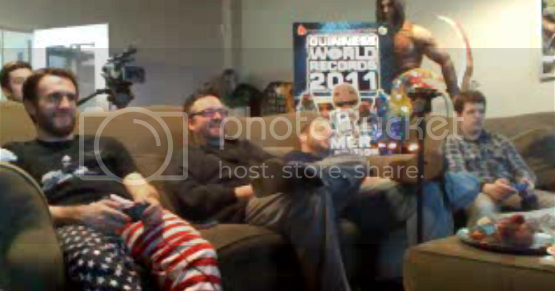 Game Informer editors Dan Ryckert, Jeff Cork, Tim Turi, and Ben Reeves have broken the Guinness World Record for the longest fighting game marathon. The four editors spent 30 hours playing Super Smash Bros. Brawl, breaking the previous record of 26 hours and 27 minutes. I spoke with Dan Ryckert about their impressive feat. I’ll start with the most obvious question. How does it feel to be a world record holder? It feels great to hold a Guinness World Record. None of us have ever held a title like this, so it’s great to do something that no one else in the world has done before. Was there any point at which you doubted that you guys would be able to pull it off? Not really…we knew we were going to do this come hell or high water. There were a couple of times I worried about falling asleep during the attempt itself, but I used my break time wisely and avoided that. How did you determine what game you would play for the record attempt? We picked Smash Bros. Brawl because it was four player and offered a wide variety of modes, characters, and options. If we grew tired of one game type, we’d switch rules up or do a Special or Team Brawl. Plus, a ton of those unlockables take forever to get. We did almost 500 matches, and just barely unlocked everything. Finally, what do you plan to do to recover from lack of sleep and other negative side effects of such an accomplishment? I just got home from the attempt about an hour before I’m typing this. Considering I only slept three hours the night before we started, I’m absolutely exhausted. Tried to sleep a full night before the attempt began, but I was too excited and couldn’t actually fall asleep. Now that I’m home, I’m gonna collapse on the bed and sleep for way too long. Thanks again to Dan Ryckert for taking the time to answer my questions and congratulations to the new world record holders. Duke Nukem Forever Config Data Reveals MP Perks and…Hats?